Dill is a herb which has a strong aromatic flavor. Fresh and dried dill leaves are used in soups, salads, salad dressings, pickles and as pretty toppings. It is mostly added to fish and other seafood preparations. Dill butter adds a lot of flavor & refreshing aroma to potato & other salads. Dill seeds are added to cooking some heavy meat dishes too. In Maharashtra (India) dill is known as ‘shepu’ in Marathi & Konkannim. Dill is cooked as a vegetable along with moong dal. It is usually prepared as a dry subzi (vegetable) & eaten with bhakris (flat breads) made with jowar, bajra or rice. Dill is a good digestive & has anti-flatulent properties. We do not like dill as a vegetable but prefer it as a herb. We love the subtle flavor & aroma of dill. 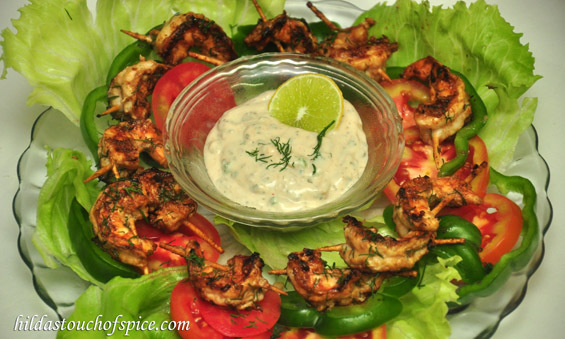 Today’s recipe is Dill Grilled Prawns with a Spicy Remoulade which is so delicious. It pairs well with cocktails & mocktails and it simply tastes heavenly as a starter. The spicy remoulade is a wonderful dip which is awesome! 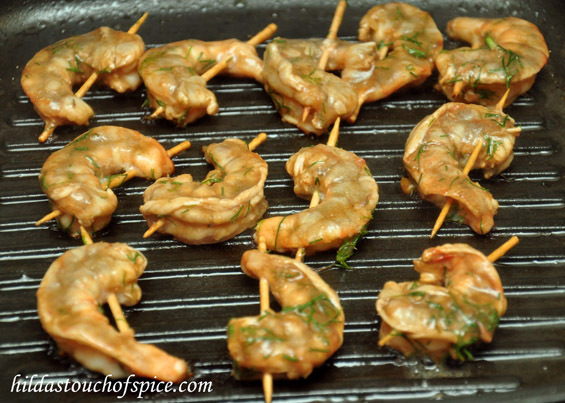 This recipe I had noted down years ago from the popular magazine ‘Femina’ and we would make these prawns on a charcoal grill. We would dig a pit and fill with lighted charcoal and place a crude grill or sometimes we would fill charcoal in a round iron dish (Gamela in Marathi) and place the crude grill in our balcony. Now we live in an apartment, so I make it on a grill pan. In a sufficiently large bowl, mix all the marinade ingredients well. Marinate the prawns in this mixture for about 30 mins. Skewer each prawn with a tooth pick. Heat a grill pan on med. heat. Brush the grill pan with olive oil. When the oil starts to sizzle, grill the marinated prawns for 2 mins. on each side or till done. Transfer on a serving plate and serve with a spicy remoulade or any dipping sauce of your choice. In a sufficiently large bowl, add the gherkins, capers, parsley or coriander, spring onions to the mayonnaise & mix well. Serve the dill grilled prawns with the spicy remoulade.